CES 2011: Cambridge Audio launches NP30 network music player | What Hi-Fi? The NP30 enables 24-bit audio playback, has access to streaming music services and internet radio stations, and offers a free remote control app for iPhone, iPod Touch and iPad. As part of the launch the company is unveiling 'a new organic digital platform' called UuVol. This platform groups together the streaming services, internet radio and remote control. The NP30 will stream audio from any UPnP-equipped device, including 24-bit/96kHz support for studio quality uncompressed files, plus AAC, FLAC, MP3, Ogg Vorbis and WAV formats. The UuVol Radio portal aims to make the world of internet radio easy to navigate using search and favourite functions on the UuVol website. Streaming music services such as Pandora and Rhapsody are supported in North America, so we're hopeful that similar tie-ins will be confirmed in the UK. 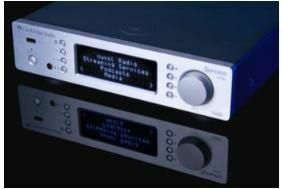 Slated for a Spring 2011 release, the Cambridge Audio NP30 network music player will set you back £400.